Last night as I was browsing through my cookbook (awesome bedtime reading!) I found a recipe for granola. 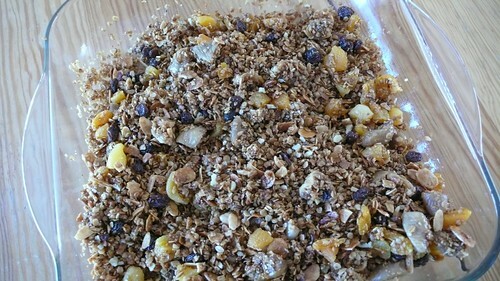 We have been buying muesli for a while and it’s so yummy and look kind of like granola. Anyway, this morning we walked down to the Londis and got all the ingredients. Shopping in a foreign grocery store is a treat. Everything is just a little bit different but the same a the same time. They also have exotic items like sultana aka grapes. Part of the recipe called for rolled oats. I looked at all the oats (and there are so many different brand and kind of oats.) and had no idea which one is roll oats. I mean everything there says it’s oatmeal. So I end up picking some organic none quick oats (but it did say you can make it in oatmeal in the microwave with it) and hope for the best. When we got home I read the back of the package and it had instruction for making home made museli. So I guess I got the right one! YAY! 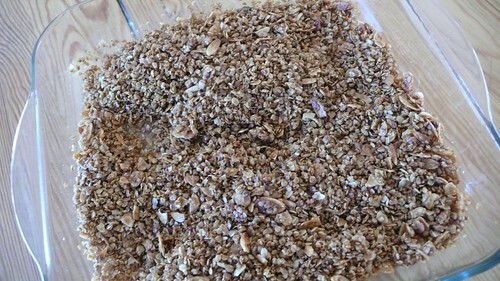 Mix the Rolled Oats with flaked almonds and sit aside. Whisk the vegetable oil and 1/2 cup of honey together. Pour into the oats mixture and make sure to coat all the oats. Put it in a baking dish and bake in the oven for about 40 minutes or until golden brown. Make sure to stir it every now and then in the oven. After all that you can mix it with whatever dry fruit and nuts you want. I end up getting some dry figs, dry apricots, and raisins. I love Ina Garten’s recipe! I made her lentil soup last week and it was a total hit. The only thing I don’t like is that everything out of the recipe book serves 6 to 10. When there’s only 2, you end up eating the same thing over and over again. But, it’s so good, I can eat it over and over again! I couldn’t find Horse Radish at the store, so we substituted wasabi. I guess you can say we made this cocktail sauce with an Asian flair. Anyway, Mr said it taste fine and wasabi is in the horse radish family so I am sure it’s awesome. Peel and devein the shrimp, leaving the tails on. 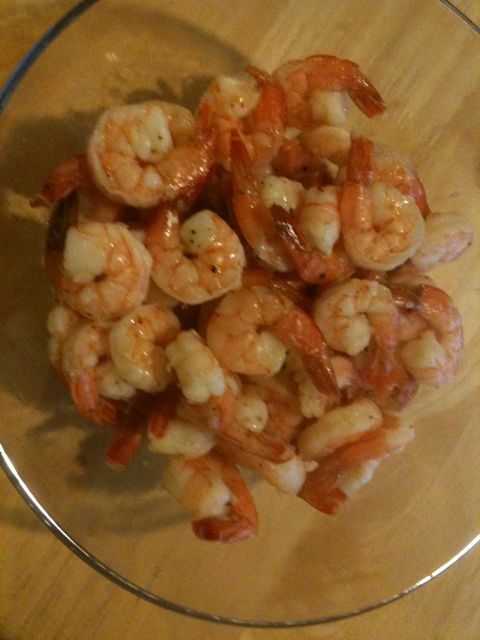 Place them on a sheet pan with the olive oil, salt, and pepper and spread them in 1 layer. Roast for 8 to 10 minutes, just until pink and firm and cooked through. Set aside to cool.